In chapter six of the book, we discussed the coup against Indonesia's Sukarno in the mid-1960s. However, this was only the final act in a drama that had begun in the 1950s, when U.S. officials decided that Sukarno's regime was at the very least complicit with the local (and quite large) communist party. 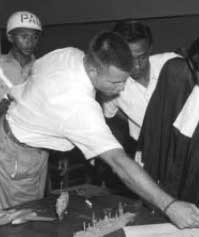 When, for various reasons, the country's military began splintering on the important “outer” islands of Sumatra and Sulawesi, Washington resolved to employ “all feasible covert means to strengthen the determination, will and cohesion of the anti-Communist forces in the outer islands, particularly in Sumatra and Sulawesi, in order through their strength to affect favorably the situation in Java, and to provide a rallying point if the Communists should take over Java.” Shortly after this, the U.S. began to send arms to the rebels, at first discreetly and then via airdrop from U.S. planes. On the more distant island of Sulawesi, where the regime lacked air power, the CIA also used civilian contract pilots to carry out tactical air strikes. In addition, policy makers began to consider the prospect of overt intervention by U.S. forces at some later point, but this would have required the rebels not only to proclaim a counter-government, which they did in February 1958, but also to hold on to enough territory to back up that claim. Barring that, the only other possibility of overt intervention would be if the situation descended into chaos, for example, if the Sukarno regime threatened U.S. property or bombed oil fields, something which the government carefully avoided. 1) Ad Hoc Interdepartmental Committee on Indonesia, “Special Report on Indonesia,” 3 September 1957, FRUS 1955-1957 , vol. 22: doc. 262; also docs. 221, 265, 268; Dulles, in telephone call with Burke, 28 March 1958, quoted in Kahin and Kahin (1995: 149); Dulles in meeting with Eisenhower, 15 April 1958; Jakarta to State, 12 May 1958; both FRUS 1958-1960 , vol. 17: docs. 62, 91; also docs. 68-70, 72-3, 85-9, 93-4, 96-8, 103; Conboy and Morrison (1999). It should be noted that the editors of the FRUS 1958-1960 volume on Indonesia (vol. 17) acknowledged that significant documents were withheld by the CIA; to get a fuller picture of the decision making behind U.S. aid to the rebels, it is necessary to consult Kahin and Kahin (1995).